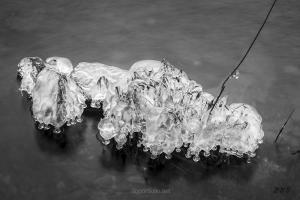 Exploring the edges of the Blackstone River in Albion, Rhode Island, I encountered many ice formations created as ice builds up on the vegetation in the winter months. Many have a beautiful sculptural quality which makes for glowing black and white photographs such as the one shown here. 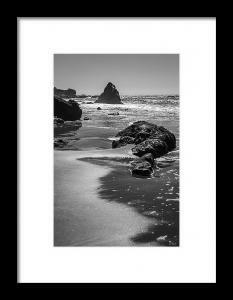 This new black and white seascape photograph taken at Muir Beach in Marin County, California by Dave Gordon. 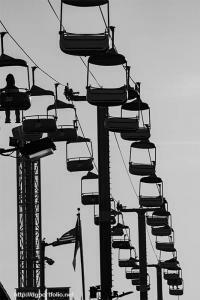 A black and white photograph taken at the Santa Cruz Beach Boardwalk in Santa Cruz, California by Dave Gordon. 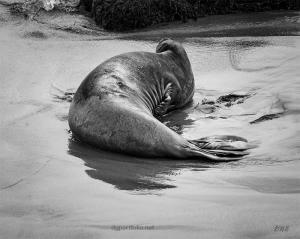 This black and white photograph of an Elephant Seal resting on a beach in San Simeon, CA. by Dave Gordon. Mature male elephant seals have a prominent proboscis which resembles the trunk of an elephant. 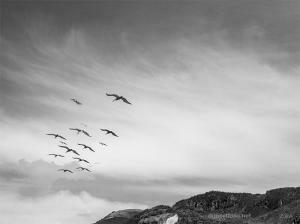 This black and white photograph of a group of pelicans in flight was taken at Garrapata Beach on the Big Sur coast of California by Dave Gordon. 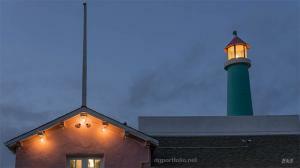 This color photograph taken at Fisherman's Wharf in Monterey, California by Dave Gordon. The sun had set and the lights had just come on. The blue of the sky contrasted nicely with the lights and buildings. 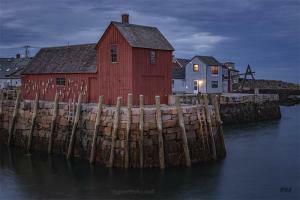 This color photograph of the Motif Number One taken at dusk in the harbor of Rockport, Massachusetts by Dave Gordon. The building shown here is a replica of the original building which was built in 1840 but destroyed in the Blizzard of 1978. 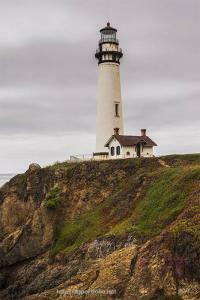 This color photograph was taken at the Pigeon Point Lighthouse in Pescadero, California by Dave Gordon. This lighthouse was placed into service in 1872. At 115 ft high, it is one of the tallest lighthouses in the United States. In this black and white photograph, the silvery leaves of the ferns glow in the quiet light of the shade. This black and white photograph of a 1949 Buick Eight Super was taken in Bluff, Utah. I've visited this scene a few times over the past few years and this vehicle is always parked in the exact same spot making me wonder when the last time it had been driven.